The fingers on my right hand dug into the hot canvas that sat 4 inches above my head separated only by the thick metal of a silver 1995 Saturn S-series roof. We were zooming down the carretera on my way back from Playa Esterillos Oeste on our way towards Jacó with my most prized possession above my head. I was sure I was going to be late. No connection, and Eduardo, the friend I had made some four days earlier, hadn’t shown at our pre-arranged time and location. The only other way to get back to Jacó was a 7am bus the next day. Out of question with my timetable… school. 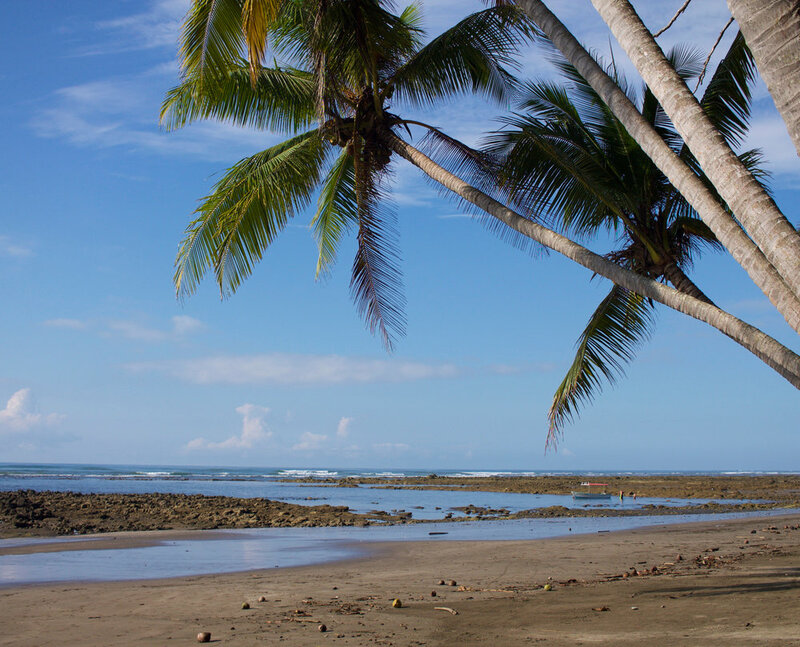 In my panic I walked down the dirt road into the tiny Costa Rican town that is Playa Esterillos Oeste, only to make it 100 feet before Roger stuck his hand out of the window of a passing car. “Que pasa, amigo?” He was back from hiking in the shaded mountains near Jacó. It was a great day for it. Boiling hot with the sun overhead piercing down on any skin it could make its hapless victim. But Roger had finally returned, and upon hearing my situation, called his local friend who said he would give me a ride for 20 mil colones. $35. I had no other option. His friend didn’t have racks, and we were working with a ’95 stick shift that didn’t start on the first few ignition twists. But we made it work using rope to carefully tie my prized possession above my head. I wasn’t taking any chances this early in my time in Costa Rica. My hand never left the canvas casing. I had been here four days now, staying on Roger’s land, a beautiful lot with a budding garden that lead into a covered roof with hammocks, couches, and chairs made from split surfboards that had been swallowed by the jaws of the local swells calmly resting in the shade. The jaws were what brought me to the small town, though for the past week it had been facing more lull than violence out in the water. “I haven’t surfed for a couple of days now and I’m going insane,” Roger told to me the previous Friday over our usual morning breakfast of rice, beans, and eggs. He was clearly masking his long plagued frustration with the least sincere of smiles. But our fortune changed overnight, as a proper swell knocked on the door the next day. Playa Esterillos Oeste seemed to awaken from its drowsy, tropical sleep, coming alive with each crashing green wall we zipped along. The sun beat down on me, peeling my skin, making sunscreen and zinc near obsolete, while the crocodiles and manta rays some 15 feet from my water-logged hot dog legs occasionally paraded by. For four days I sat in the lineup, more times than not by myself, save two local guys and a kid who had also caught news of the swell early. On the second day, I had slowly started noticing the strange tendencies of the mysterious regional breaks. Looking out left from the coast sat a beach break. Initially hard to time due to the lulled mushy conditions, it seemed to turn a new leaf with the incoming swell, providing enough green and feathering for a beautiful barrel to engulf its rider and take them on a visual journey. To the right of the shore, a reef break, only to be ridden in the hour or two before or after high tide. It easily was the most consistent break of the weekend, leading its paddling journeymen out into the deeper waters of the warm, blue sea with a continuous reward waiting on the other side of the curling marine bodies that hurled themselves (and their passengers) to shore. By day four I was crisp, skin seeming to shed its weight with each dive under an oncoming wave. My arms and shoulders were tight, my abdominal muscles tighter. I’d been out four days straight for 6-8 hours each. But I’d never been happier. The brilliant white of my teeth creeped, as best they could, through the cracked lips of my face as I sat in the Saturn S-series that fourth day, my hand firmly clutching the canvas encasing my board above my head. The swell had come, just in time. I hadn’t been too early, or too late. What started slowly and lazily in the sleepy town of Esterillos Oeste had triumphantly come alive. Playa Esterillos de Oeste was only the first place on my long 3 and a half month journey of surf throughout Costa Rica, but it certainly introduced me properly. The pounding sun, the surly crocodiles, the generous sand, the harsh reefs, the passion and love of a locally 300 day sport that leaves me thinking. Maybe I read my situation wrong. Maybe it was a sign that Eduardo didn’t ever show up. Maybe I shouldn’t have left. P.S. Excuse the photos, or rather, lack-there-of. I was too busy enjoying myself in the water. This is a break, when it goes, that is worth discovering on your own. And give Roger a hello for me.